Eastwood CONTOUR® Aluminum Reinforced Repair Compound Body Filler is rated 3.2 out of 5 by 16. Rated 5 out of 5 by Kovi from great product! hardens like armor when used right! First off, I am NOT a professional body tech. I grew up in the poor folks sector that scrounged and used anything and everything cheap. that said, I've had experience with a whole bunch of different body materials. more than I'd like in some cases. first thing I did was test a small blob of it with both cream and liquid hardener and it works great with both. (I prefer the cream because the color changes as it mixes). It goes on smooth and pretty much bubble-less (IF you've done your prep correctly) . I do suggest you do your buildups in stages and try not to slop as, once its hard? its not an easy sand without a Disc sander. I even smacked it with a hammer to see if I could fracture it and... nothing! so, for all the negative remarks? learn to test your product if you've never used it... this stuff rocks! Rated 5 out of 5 by Bobs 84 Nissan 300zx from works as stated. it does require patience. I have used this product on and off over a couple years. It works great. It has been used in areas that I know has some chance of flexing.. I am restoring a 60 Triumph TR 3 and the inner fender wells on the front and back will flex. I used it over welds where new sheet metal was welded in. No issues. It took me a few tries to get the amount of hardener just right. It does take a few hours to set up. Even then it has a tacky feeling. I found that if I take a small knife blade and gently scrape the surface, it will remove the portion of the resin that comes to the surface. Then I took some used 60 grit sand paper to to scuff off the surface before taking a new piece of 60 grit sand paper to It. I am very happy with the product. It does stay flexible and moves with the metal so you do not get stress cracks. Do not expect to sand it down until several hours has gone by. BE SURE to stir up the contents of the can to mix it thoroughly, as the liquid will separate from the solid paste material after sitting, even for amshort period of time.. I personally would recommend this product. WHAT IS THE TEMPERATRER RANGE OF THIS PRODUCT, COULD IT BE USED TO ON A RADIATOR? This would only be good until about 250-300F. This will not stand the curing temperature of powder coat. The best filler to topcoat with powder is our high temp lab metal. Can I encapsulate the rust before applying Eastwood Contour Aluminum Reinforced Compound Body Filler. If you wish to encapsulate the rust prior to using our Aluminum filler we recommend using our Platinum Encapsulator for maximum durability. A rough estimate would be to use 1/2 tea spoon hardener for about 2oz of filler. Can I use this product to fill a small hole in my transmission clutch housing? &nbsp;My concern is temperature and water exposure, will this hold up provided I prep and paint following application? We wouldn't recommend filling holes with a body filler. We would recommend welding such a hold shut and then metal finishing the part. How can this be stored so it won't harden in the can after a couple months. Yes the lid was tight. The biggest thing is making sure this product is stored at a room temperature to prolong its life. What color does it dry to? &nbsp;I need it to set up white. This is a medium- darker shade of gray. can other fillers be put over this? You can certainly apply other fillers over top of this one. 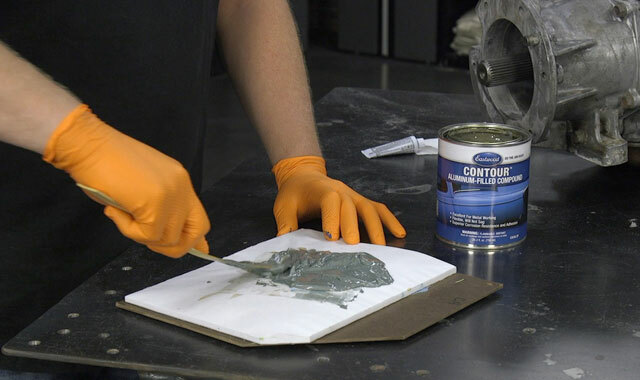 Contour® Repair Compound is reinforced with aluminum for a stronger, corrosion-resistant repair. 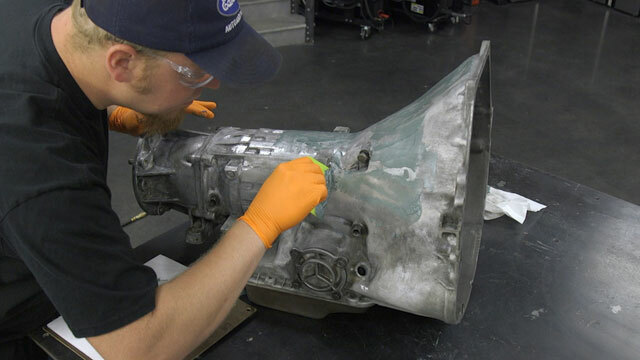 Eastwood's uniquely formulated filler is fortified with aluminum particles to produce a repair with extra strength, corrosion resistance and durability in galvanized steel and aluminum. Includes Liquid Hardener. A uniquely formulated filler fortified with aluminum for strength, corrosion resistance and durability. Use to repair factory leaded seams and high strength applications as well as areas prone to moisture. Its corrosion resistant properties prevent rust from coming through the repair. Thoroughly mix desired amount of material with blue liquid hardener. Using a clean spreader, fill to desired level. Do not exceed 1/4" depth. Allow to cure for at least 15 minutes before sanding. Abrade with 40-80 grit and follow up with 120 grit to achieve desired contour. Final finish with finer abrasives. If necessary, apply Eastwood’s 13521ZP Contour™ Glazing Putty for final finishing. Topcoat with quality primer, such as Eastwood’s Epoxy or Urethane Primers. Always wear eye, skin and resporatory protection when using this product. Always apply in a well ventilated area. Consult MSDS and product label for specific safety warnings. Surface must be clean and free of wax, grease and debris. Abrade surface using 36 grit, or finer. Thoroughly mix desired amount of material with 2% liquid hardener. Do not exceed 1/4" depth. Allow to cure 15 min before sanding. Abrade with 40-80 grit and follow up with 120 grit to desired contour. If necessary, apply Eastwood's Polyester Glazing Putty (13521ZP) for final finishing. Topcoat with quality primer such as Eastwood's Epoxy or Urethane Primers. Do NOT return catalyzed material back into can.